• 1841 Estate of Malcolm McNeill, Cumberland Co., NC. 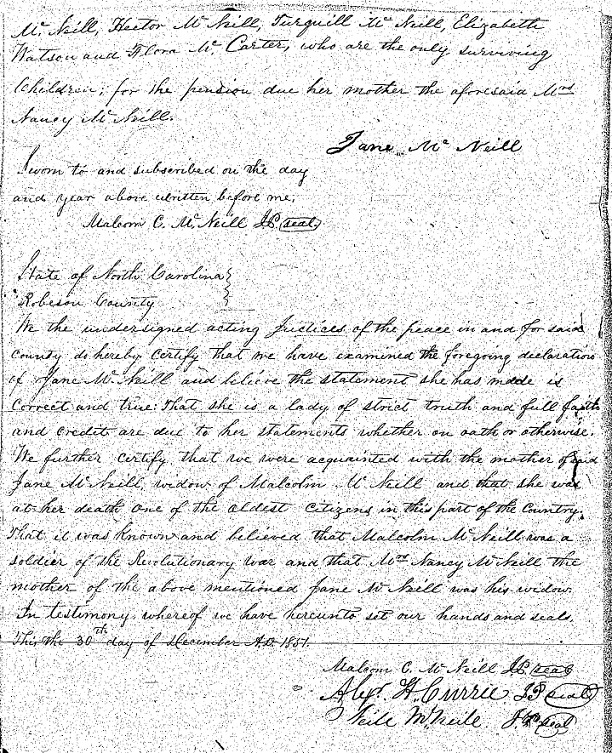 • Will of Turquill McNeill, 1855, Dent Co., Missouri. Hector McNeill (the tailor) son of Malcom McNeill (Rev War soldier) who died in 1810 in probably Cumberland County, NC. Malcom McNeill's wife was Nancy McNeill, who died in the 1840's, age 93 in (Robeson Co.?) NC. (Malcom Fowler thought Malcom McNeill was a brother of Archd McNeill who married Jenny Bahn Smith). This also came from Malcom Fowler: Hector (the tailor) McNeill, son of Malcom McNeill, had a brother who moved to St. Augustine, Tex. about 1835. He became known as "Texas Neill" McNeill. (Important: Neither of Fowler's claims here have solid basis in fact.) 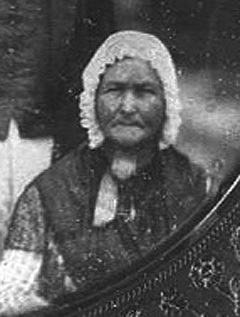 Nancy McNeill had a daughter, Jane McNeill, who married a Wm. McNeill. Nancy was one of the oldest living residents in Robeson Co. when she died. Malcom McNeill owned 1,140 acres in Moore Co, NC and 444 acres in Cumberland Co, NC. Malcom McNeill married Nancy McNeill in the Spring of 1776. The marriage licence of bann wasn't gotten until 1778 for which they paid 60 pounds & was witnessed by 'Hector McNeill (a friend)'. Above from Jerry McNeill 5 Jan 1983." Malcolm was in the Battle of Cain Creek and the Battle of Guilford Courthouse. Read Malcolm's war records, pages: 3 4 5 6. In 1854, Jane and her husband William, living in Robeson County, sold their interest in Jane's father's lands around Danily's Creek on Upper Little River in Cumberland County and his lands in Moore County to three men: James P. Roper (or Rosser), Daniel McArthur and John W. McKay. The lands in Cumberland bordered Neill McNeill, Esquire, who has not been identified (but who is believed to have been "Surveyor Neill" McNeill). Jane's sister, Flora wife of Neill McArthur, also sold her lands that year to the same parties, and Chatham County records show Daniel McArthur was their son, among other children. 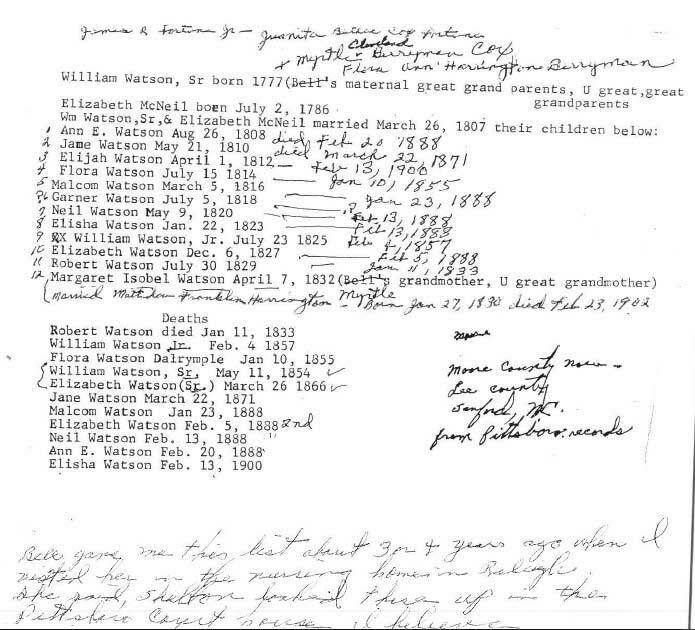 Since Malcolm and Nancy married in 1776 and we only have the names of children born in the mid 1780s and early 90s, who were the children born during the war years of 1776 and up to 1785? Did the war keep Malcolm and Jane apart during that time and prevent her bearing children during that period? One child didn't survive to 1851 when the pension records were written. The lands of the father, Malcolm, were divided seven ways and only six children were included in the pension application. 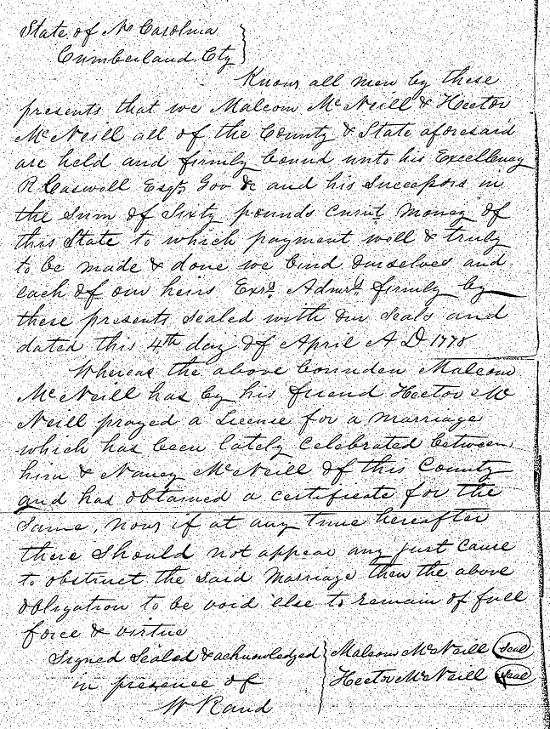 The seventh child and his heirs were ignored or unable to be found when the pension was applied for, but his name was Malcolm McNeil and his estate record of 1841 in Cumberland County reveals he survived to 1841, married and had several children. The 1841 estate has detailed information about the father Malcolm McNeill's vast land holdings and how they were finally divided by the court to include the surviving family of the son Malcolm. I have to take exception to some old, accepted genealogical info on the wife of "Little Billy" McNeill. For generations, local historians in Robeson County have believed and written that "Sailor Hector" McNeill's son, William "Little Billy" McNeill married Jane, a daughter of Nancy McNeill and Hector McNeill. 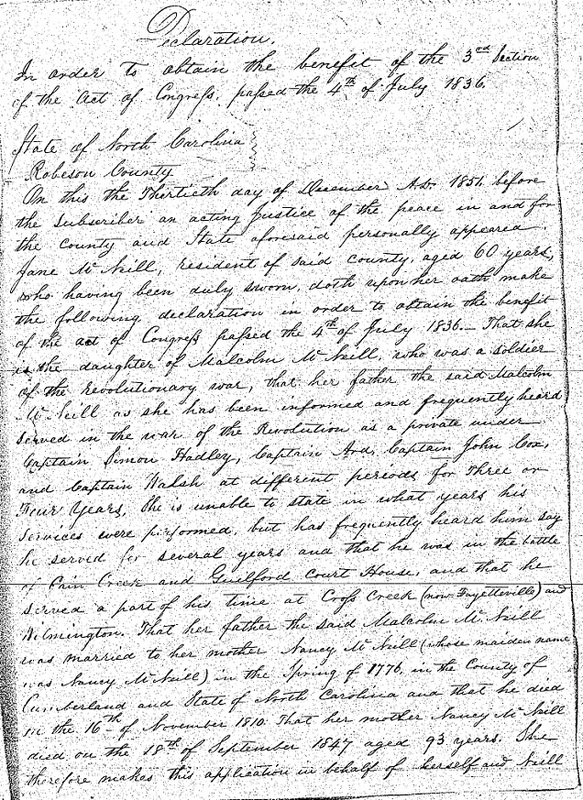 However, original records, particularly the Revolutionary War pension records of Malcolm McNeill found here, show Jane McNeill—daughter of Nancy McNeill and Malcolm McNeill—applied for a war pension in 1851 as a resident of Robeson County who was 60 years of age, putting her birth year at 1791 (see pages 4, 5). In her history of the family of "Little Billy" McNeill, Mabel Lovin cites the birth year of Little Billy's wife Jane as 1791 which matches the calculated birth year of Malcolm's daughter in the pension records and the tombstone of Jane McNeill in Robeson County. Additionally, the 1850 census of Robeson County, NC, shows "Little Billy" and Jane living in upper Robeson and her age is 59; they are living next door to Hector McNeill and his brother Neill T. McNeill who were cousins of "Littly Billy" McNeill. 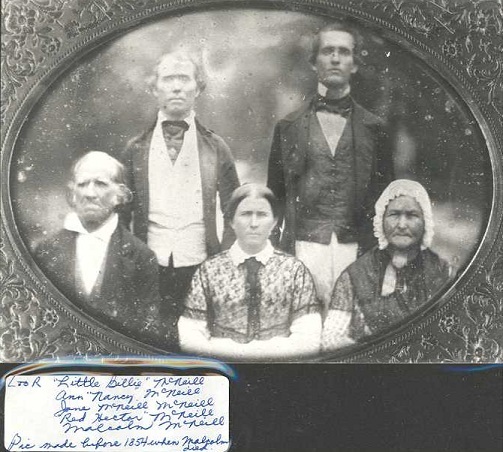 Here is a picture of "Little Billy" and his family which I copied from Mabel Lovin's disk containing her family histories. The children below are in the order listed in the pension record provided in the links above. William Watson, 26 Mar 1807. Lived in Longstreet section in Moore Co., NC in 1860. Many children. Mary "Polly" Kelly; several children who all lived in Cumberland Co., NC. Malcolm died there. Neill McArthur of Chatham Co., NC. Had son Daniel McArthur and other children of Chatham County, NC. This was "Texas Neill" McNeill. He married twice, first to Sarah McIver and had two daughters who married Webb brothers in Texas. Married second to Mrs. Delilah (née Meek) Fry. Elizabeth McNeill; moved to Dent Co., Missouri and there both lived and died. Several children. 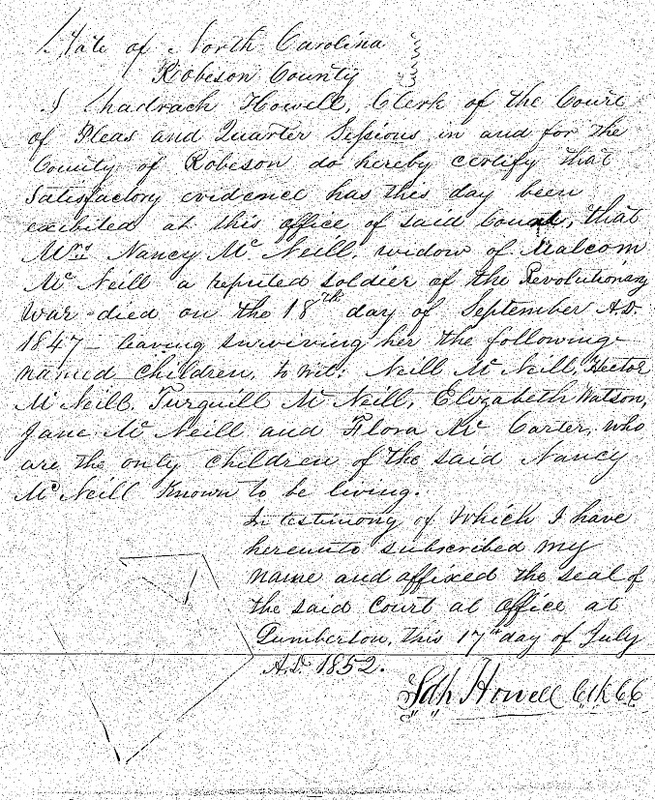 Turquill's will of 1855 in Dent Co. devised to the heirs of William Watson his interest in his father's estate in Moore and Cumberland Co., NC. This may be "Tailor Hector". Married Rebecca Cameron?